Visual Frameworks are a great way to gain marketing and business insights. I use a range of them in my work with clients in various creative and strategic marketing engagements. I love using them because they combine creativity with process to produce specific outcomes. Put another way; visual frameworks provide rules and constraints that focus attention and drive results. Another benefit of using visual frameworks is that they make use of visual spatial intelligence – tapping into different parts of the brain for generating ideas. Visual frameworks are also great because the findings they produce are easy to understand even at a glance, making the transfer of information more efficient and stickier. One of my favorite visual frameworks is called The Difference Map. It’s one of the many brilliant creations of the author, storyteller, and professional communicator Bernadette Jiwa. I’ve been using it for several years, and it’s become a go-to tool when I’m working with clients on defining differentiated value. 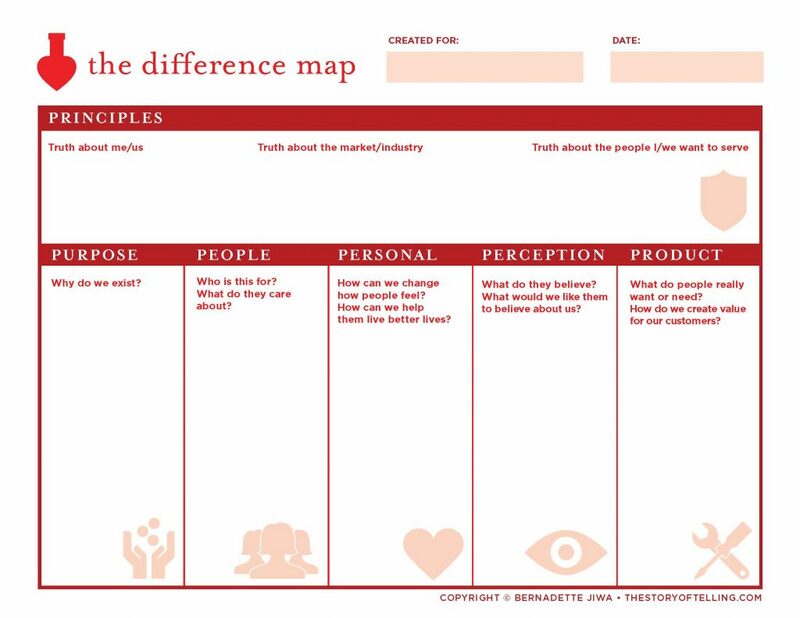 The Difference Map is a visual framework rooted in empathy with the goal of helping a business to differentiate itself in a way that is both genuine and meaningful. It takes a daunting task and breaks it down into a series of manageable steps, each based on completing a statement or answering a simple (but perhaps not easy) question. 2. Purpose: Why do we exist? 3. People: Who is this for? What do they care about? 4. Personal: How can we change how people feel? How can we help people live better lives? 5. Perception: What do they believe? What would be like them to believe about us? 6. Product: What do people really want or need? How do we create value for our customers? The beauty of this framework is that it is simple. Even in a group setting, this framework takes very little time to complete while producing a wealth of knowledge. My favorite way to use is having people use post-it notes to jot down ideas and then to work as a group to talk through them. I’ve used this framework in many engagements, and it’s never failed to produce at least one, and usually many, light bulb moments. So, if you’re looking for a great team activity for your marketing organization or perhaps searching for a tool that can help you be more effective with your clients, I suggest giving The Difference Map a try – (Download Difference Map). Of course, you can always contact us you’re interested in getting some help in defining the important things that make you different in a meaningful way.